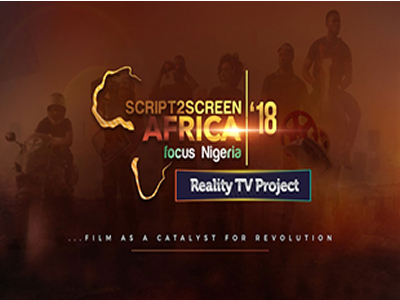 Script2Screen Africa is a Filmmaking Reality TV project train and engage 60 Filmmakers each year, to produce 4 Short Films and 1 Feature, to tackle Social illshead-on, educate viewers while entertaining them, and hopefully pique effective action once the screen’s glow diminishes. The reality TV show, themed “Film as a catalyst for revolution” will commence on March 24, and last till April 21. In a statement, the organisers said the show is focused on raising a new breed of filmmakers who understand that aside business, film still has the capacity to create social impact in every society. Script2Screen said, in addition to the glamour and glitz of films, it seeks to explore its transformative effect. Sixty finalists (filmmakers and actors) have been selected after auditions held in Lagos, Benin, Abuja, Owerri, Enugu and PortHarcourt. “Through training, mentorship, and support, the vision of these trailblazers will shape thought provoking short and feature films that will pioneer positive revolution in Nigeria, and across the continent of Africa,” the statement read. “The Journey began in 2017 with a press conference in Lagos, auditions across Nigeria, and the 60 finalists for the Reality Show were selected. “Expected facilitators/mentors, Guests and Jury for our 2018 Script2Screen Africa reality TV project includes: Steve Gukas, Teco Benson, Stella Damasus, CJ Obasi, Pascal Amanfo, Niyi Akimolayan, Majid Michel, Kalu Ikeagwu, amidst others. “The Reality TV show is scheduled to hold for 4 weeks at Amen Estate Ibeju Lekki Lagos Nigeria…The reality TV show will climax with the Script2Screen Africa Short Films Premiere & Awards on April 21, 2018. “Sequel to the Reality TV show, we are producing a feature film titled, “IF I AM PRESIDENT”.